Are your ready for a SUPER party!? The big game is this weekend and I have five Super Bowl dips for you to try. From meaty to vegetarian to something sweet, I have you covered with these yummy recipes! Last week Heidi Glaus from KSDK's Show Me St. Louis asked if she could film five of our favorite dip recipes in Eckert's Cooking Classroom for Show Me's St. Louis' Super Bowl Special. I immediately dug through my file of dip recipes to find these game-day favorites. There is something for everyone in this group of recipes. 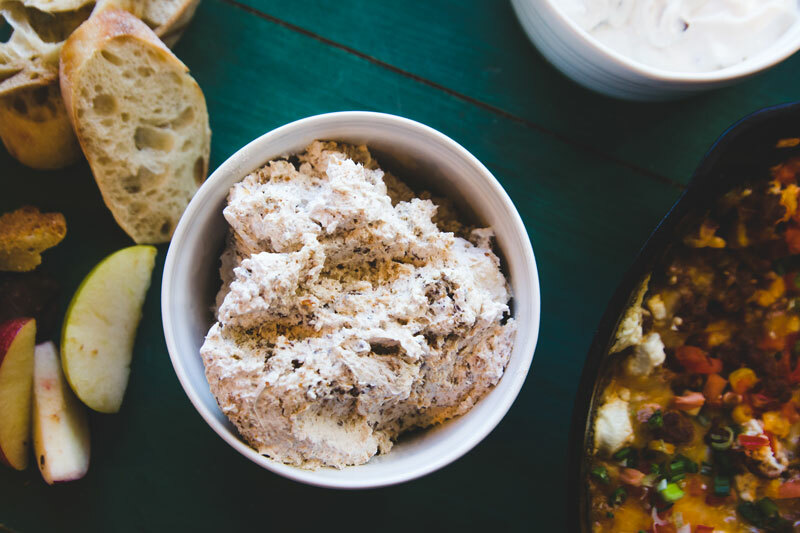 Queso Fundido with Eckert's Chorizo and Roasted Garlic Bacon Dip satisfy the meat lovers in the room while Decked-Out Hummus adds flair to a classic dairy-free, vegetarian dip. For an "easy button" option, you can't go wrong with Pepper Relish Spread - a simple mixture of cream cheese and Eckert's Pepper Relish. And last but not least, Toffee Dip rounds out the bunch with something sweet to spread on sugar cookies or fresh apple slices. You can find all the recipes for these game day dishes below. I hope you can catch my cooking demos for these five Super Bowl dips on Show Me St. Louis this Sunday, February 4th at 10am or visit http://www.ksdk.com/show-me-st-louis. Cut tops off 2 heads garlic. Drizzle with olive oil. Wrap heads in foil and bake in preheated 400-degrees oven until tender about 45 minutes. Cool. Remove garlic pulp; discard skins. Mix pulp with 1 1/2 cups dairy sour cream and 3/4 cup mayonnaise. Stir in 1 to 2 Tbs. fresh chopped chives and scallions. Add about 1/2 Tbs. Worcestershire sauce and pepper. Gently mix in 6 slices chopped crisp Eckert’s bacon. Makes about 2 1/2 cups dip. Mix cream cheese and relish until creamy. Serve immediately with crackers or refrigerate until serving time. Serve with crackers or fresh cut vegetables. Spread hummus on a medium plate. Choose Med or Mex toppings. Arrange toppings in a concentric circles. If using taco seasoning, mix it into the hummus before spreading the hummus. 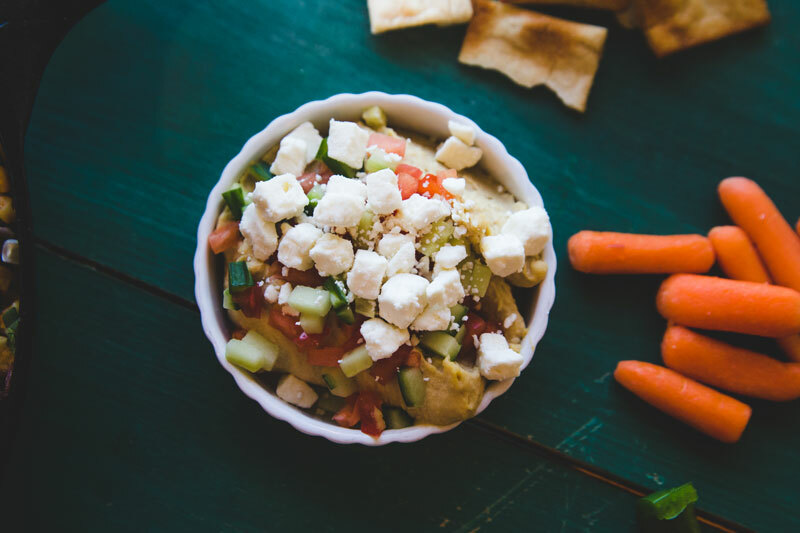 Serve immediately with pita chips, fresh tortillas and or fresh cut veggies. Preheat oven to 350 degrees. In a 12” cast-iron or oven-proof skillet combine chorizo, onion, pepper and corn. Cook over medium heat for 8-10 minutes. Drain fat if desired. (Note: Eckert’s chorizo does not generate drippings.) Add cheeses and stir to incorporate. Place skillet in the oven for 12 minutes or until bubbling. Remove from oven and top with tomatoes, green onions and cilantro if desired. Serve immediately with tortilla chips. Serves 12-15. In large bowl with a mixer, beat cream cheese and whipped topping until smooth and creamy. Add in brown sugar and beat again until smooth. Stir in toffee bits and vanilla. Serve immediately with apple slices and cookies or refrigerate until serving time.